Barcelona is the second largest city in Spain and the capital of Catalonia. It is located on the shores of the Mediterranean and enjoys a mild climate all year round.Barcelona is one of Europe’s largest and most successful ports and one of the world’s leading cities in art and architecture. From the modern cruise terminal at the docks you will need a taxi or tour to see the artistic beauty of this unique destination, credited to the talents of Joan Miro, Pablo Picasso, Antonio Gaudi, Jose Clara and others. Stroll the mosaic-paved Ramblas, the city's social hub, with open-air cafes, street entertainers and flower displays. See its unique Catalonian cultural heritage in the ancient Gothic Quarter, the surrealistic architecture of Antonio Gaudi and some outstanding museums. Sights of interest include the Columbus Monument, the Cathedral of Santa Eulalia (1298 to 1454), the Maritime Museum, Picasso Gallery, La Sagrada Familia (Gaudi's unfinished cathedral), Palau Guell (Gaudi mansion) and the Olympic stadiums. Port Location – The Port of Barcelona is the starting and arrival point for many Mediterranean cruise itineraries. It is a short distance from the city centre and has seven operating terminals. It has efficient connections, including access to the railway stations and airport. Transport Links – The Barcelona airport is 12km (7.5mi) southwest of the city centre and receives many direct flights from North America and Europe. International trains and buses run to Barcelona or you can get there via ferry from the Balearic Islands and Italy. 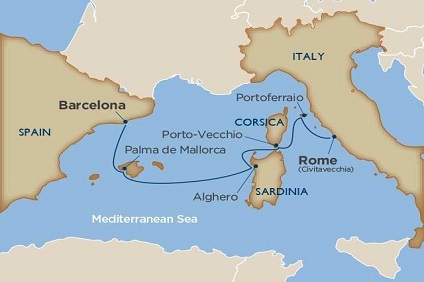 6 Night Cruise sailing from Barcelona to Rome aboard Wind Star. 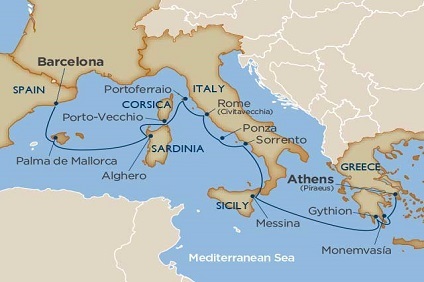 13 Night Cruise sailing from Barcelona to Athens aboard Wind Star. 10 Night cruise sailing roundtrip from Barcelona onboard Costa Favolosa. 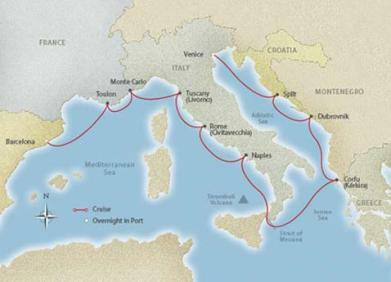 12 Night Cruise sailing from Barcelona to Venice aboard Viking Star. 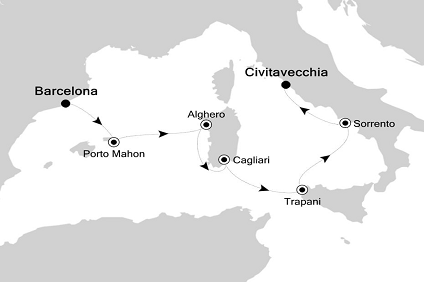 7 Night Cruise sailing from Barcelona to Rome aboard Silver Spirit. 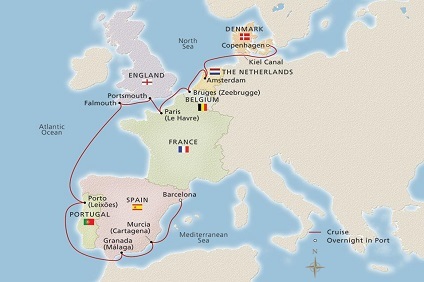 14 Night Cruise sailing from Barcelona to Copenhagen aboard Viking Jupiter.